A long-term project on insect-seed interactions, currently being carried out by researchers of the Institute of Zoology (Chinese Academy of Sciences) in a subtropical forest near Dujiangyan City, Sichuan, China, revealed the presence of larvae of an unknown weevil species eating the seeds in the pods of a shrubby legume. Scientists from the Institute of Zoology, China, Xiangyang Lv, Zhishu Xiao, Zhiliang Wang, Runzhi Zhang, and Miguel A. Alonso-Zarazaga, also affiliated with the Museo Nacional de Ciencias Naturales (CSIC), Spain, published the description of the new genus and species, named Evemphyron sinense, and added data on its biology in the open access journal ZooKeys. Because of its peculiar features, it was difficult to locate the closest relatives of this new species. However, a few characteristic traits of the body and genitalia, strongly pointed to its placement within the tribe Deporaini. The closest, although seemingly rather far-related to the new species, beetles are considered to be a genus with scattered distribution, stretching from the Russian Far East to the Indian Himalaya. 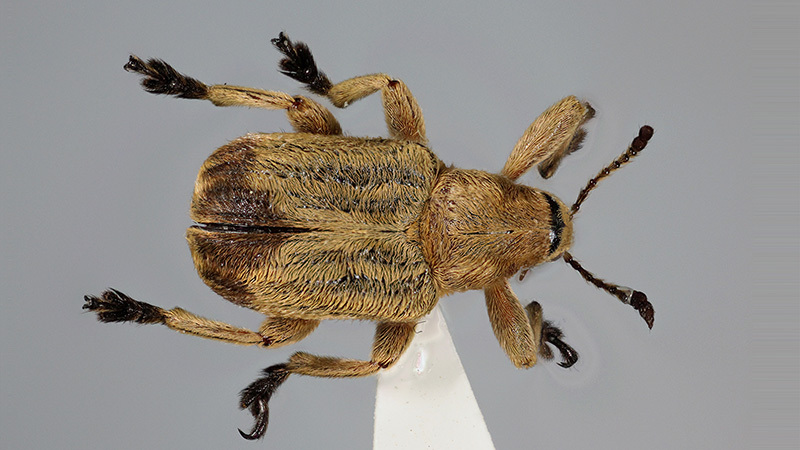 However, they are smaller weevils whose females cut shoots to lay their eggs. On the other hand, the males in both genera share a peculiar patch of hairs, probably related to pheromone dispersal. Likewise, each species is associated with legumes. The curious feature of this weevil group (Deporaini) is that the vast majority of its species are leaf-rollers. The females cut a hardwood leaf in a peculiar and mathematical way and roll it, laying one egg inside each one. 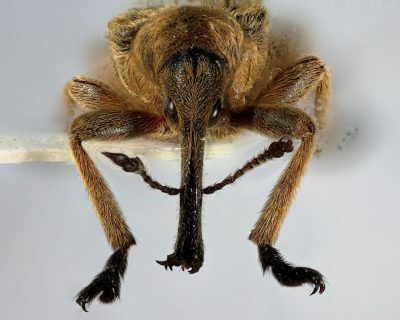 This behaviour, which is known in other far-related weevils of the same family, seems to have appeared independently in different evolutionary branches. In the case of Deporaini, this behavioural trait evolved after the new genus became a distinct one. As a result, the new genus is considered to be one of the two most primitive within the tribe. In fact, it might be the most primitive one, taking into account a number of morphological traits as well. It could be that the new beetle never knew how to roll a leaf to make nests and shelter its offspring.